You are invited to a lunchtime reading group to discuss the works of George Orwell. The Orwell Reading Group meets every month to discuss a book by Orwell. On April 10th, we will end this series with a discussion about a book heavily influenced by Orwell: Anthony Burgess’s 1985. In characteristically daring style, Anthony Burgess combines two responses to Orwell’s Nineteen Eighty-Four in one book. The first is a sharp analysis: through dialogues, parodies and essays, Burgess sheds new light on what he called ‘an apocalyptic codex of our worst fears’. Part two is Burgess’ own dystopian vision of industrial disputes and social unrest. 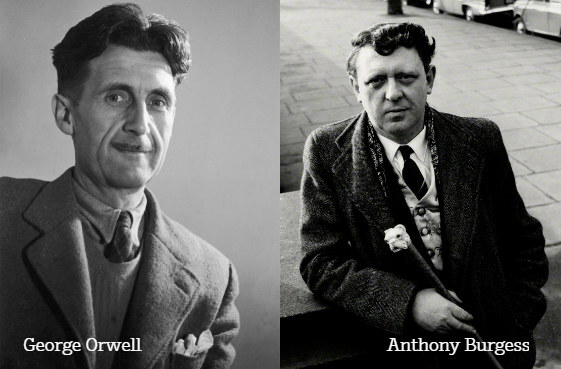 Anthony Burgess claimed to have met Orwell in a pub during the Second World War. Whether or not they actually met, the collection of books at the Burgess Foundation contains a complete set of Orwell’s novels and non-fiction works. The two writers have much in common: their genesis as colonial novelists; their status as English outsiders; their involvement in literary journalism; and their lasting reputation as inventors of nightmarish fictional futures. This informal reading group is free and everyone is welcome. The discussion will last an hour, and you are welcome to join the staff of the Burgess Foundation for tea and biscuits afterwards. If you would like to attend, please email events@anthonyburgess.org or register on Eventbrite.